Joe picked up some ground turkey last week. It was buy one, get one free. I froze one of the packages and put the other in the fridge. I hadn't decided what to make with it and almost put it in the freezer with the other pack. I'm not fond of turkey burgers, so that wasn't an option. We already had spaghetti with meat sauce last week, so that wasn't an option either. And I really wasn't in the mood for a big pot of chili. Don't get me wrong, I love chili and can usually eat it any time of the year, but the heat has been really getting to me lately and chili just wasn't something I wanted to cook or eat in the middle of a heat wave! Just before I put that second pack of turkey in the freezer, I remembered eating a Sloppy Tom Sandwich at a cute little restaurant in New Hope, PA many years ago. 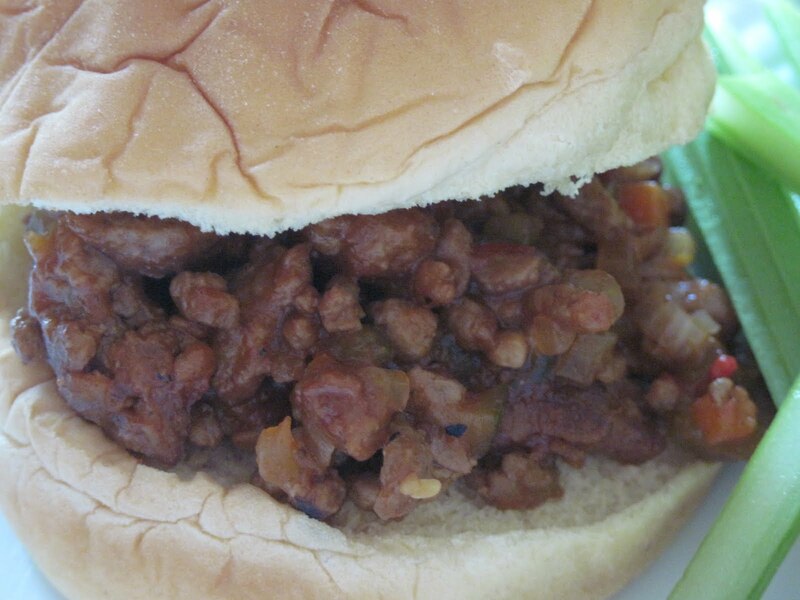 No, not a Sloppy Joe, it was a Sloppy Tom. Get it? Tom Turkey? Okay, anyway, I recently saw a recipe on Nicole's blog, Colie's Kitchen, for Very Sloppy Joes. I'd never made Sloppy Joes from scratch before. I always added a can of Manwich to the cooked ground meat. Or, if I didn't have a can of Manwich, I used the seasoning packets from the grocery store. I knew when I saw the recipe I wanted to give homemade a try, since we are trying to cut out processed foods as much as possible around here. I intended to follow Nicole's recipe as written, except for the ground turkey in place of the ground beef. But as usual, I strayed from her original recipe and added in a lot of fresh veggies. Oh, well. I tried. Still, Nicole's Very Sloppy Joes recipe and that cute little restaurant in New Hope were the inspiration for this very tasty meal! In a large frying pan, brown the ground turkey and vegetables. Serve on your favorite homemade or store bought buns. Plus, the added vegetables really stretch the meat a bit. We were able to get 3 nights' dinners from this one pot of Sloppy Joe's. The first night we topped fresh baked rolls (from the store's bakery) with the Sloppy Joe mixture. The second night, we used leftover hamburger buns and had a side of fried zucchini and some celery sticks. The final night, we used leftover hot dog buns. I was even thinking that the Sloppy Joe mixture would be great on top of a baked potato! I do the same thing, I try to get as many veggies in there as possible! Thanks! I make homemade sloppy Joes. Store bought doesn't even come close. I will have to try it with the chipolte sauce next time.